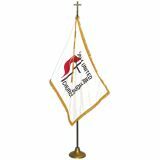 Show support to the United Methodist Church with a United Methodist flag from Tuff Flags.The United Methodist flag features a pure white background with the Insignia of the cross and the dual flame that represent Christ and the Holy Spirit. We have both indoor and outdoor United Methodist Flags that cater to your diverse flag flying needs. 100% made in USA, our United Methodist flags will make a great addition to your home or church. Shop right away and get the advantage of the best prices, quick shipping and much more! 100% customer satisfaction guaranteed! 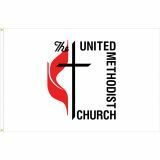 Our United Methodist Flags are made in the USA are made of SolarMax 200 Denier heavy duty outdoor nylon and finished with a white poly sateen header and heavy duty brass grommets to insure maximum durability. The fine craftsmanship and attention to detail will make our United Methodist flags truly special. Show your religious spirit and support to your church with our United Methodist Flags available in various sizes including3'x5', 4’x6’ and 5’x8’, offered at competitive rates. Our 3'x5' United Methodist Indoor Flag with Gold Fringe is perfect for parades and as adornments in homes and churches. Browse our collection of United Methodist Flags and pick up a model that suits your needs. Should you need any tips, just call us at our toll free number (888) 287-3524 or email at customercare@tuffflags.com and we shall assist you.